Looking for simple but classic for your wedding day? The Melbourne Bridal Earrings are just that. These dainty rose studs are the perfect accompaniment to your polished bridal style and will be your go-to earrings till the end of time. 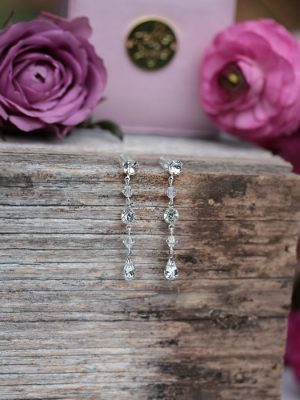 Simple and lovely, the Melbourne Bridal Earrings are a great all-rounder jewellery piece. Made in and named after Melbourne, these dainty flower studs will not let you down on your wedding and any special occasion afterwards. The rose settings are our simple and classic signature design. The Melbourne wedding jewellery set in the rose gold, are my go to jewellery set! Size: The flower is 10mm wide and long. These earrings are packaged in our signature pink silk Hello Lovers box. Consider these classic earrings matched with the Melbourne Hair Comb or the Melbourne Bridal Bracelet. If you are looking for something a little different, the Luxe Melbourne Bridal Tiara is our signature piece. Bridal jewellery made with love in Australia by Hello Lovers. Also wedding dresses designed in Melbourne Australia just for you.